"There's a bright golden sun in the meadow. There's a bright golden sun in the meadow. The corn is as high as an elephant's eye and it looks like it's climbing right up to the sky." It rained today and the sun came out which turned outside into a bit of a steam bath. This is corn-growin' weather. Ample moisture, brilliant sunshine and warm temperatures combine to make it grow 3-4 inches a day. When I was growing up, the phrase "knee high by fourth of July" meant you were going to have a good crop. Now days, with hybrids, pesticides and herbicides, if it's not chest high by July 4th, something is seriously wrong with your corn. 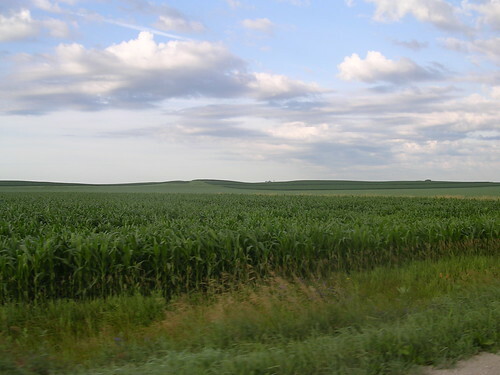 This shot was taken between Sabula and Maquoketa and is typical of Iowa corn. I'm an introvert. All that means is that I get recharged when I'm away from people. Extroverts get recharged when they are with people. Growing up on a farm, in the summer, my favorite place to recharge my batteries in August was the corn field. It could be 98 walking out to the field, but you dive into the rows and the temperature drops a good 10-15 degrees. I would lie down on the ground, on my back, and look up at the sky. You could smell it. You could almost hear it growing. There are times, when life gets maddening, that I sincerely wish I knew someone who would let me lie down in their corn field. No cell phone. No computer. No "modern life" with me. Just the smell of August in a corn field. Troubles would certainly seem less invasive after spending a couple hours lying on the ground looking up. Get that couch yet, so we can toast to introverts and get toasted in the process?